Google Webmaster Tools recently added some features to the toolkit. Those include the ability to quick search for sites in your profile, block sitelinks for subpages, review page removal requests made by others and fading out the unverified sites on the home page of the tool. The two most significant changes are the sitelinks addition and removal request addition. 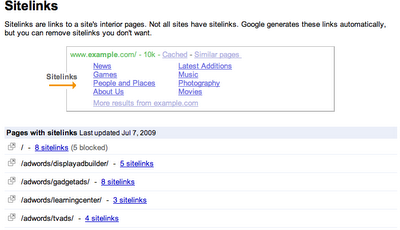 This feature is something they needed to add since displaying inner/deeper page sitelinks back in November 2008. It would be nice to know who made the request, but I doubt Google would show that.